That’s the end of the analysis. 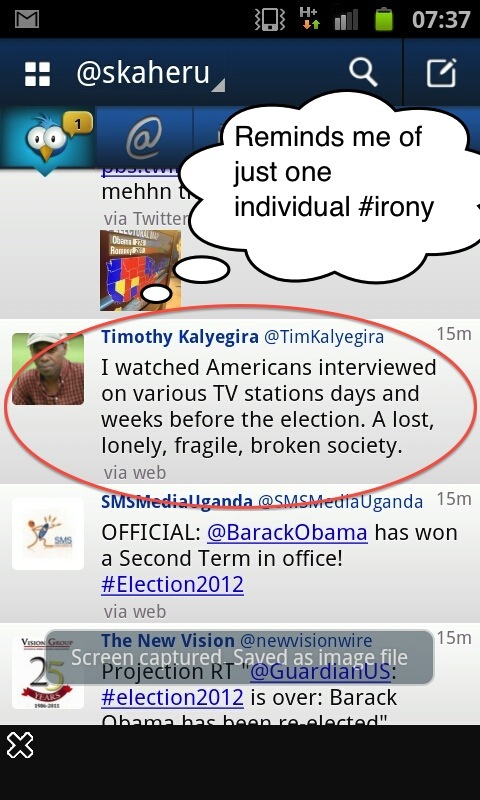 Now, Timothy Kalyegira and Donald Trump both need to get a grip! Today’s entertainer-by-employment-of-the-day turned out to be a quiet, non-assuming driver. His silence, I have began to suspect of late, might be linked to vast amounts of blank spaces within the confines of his mind. Walking out of a morning meeting into a heavy drizzle this morning, I looked round my client’s office parking lot and failed to spot the vehicle anywhere nearby. The driver, for some reason still mysterious to me, is plagued by the type of bad luck that ensures there is NEVER parking spot nearest to the entrance or exit of whatever place I may be going to. He therefore invariably ends up parking in some part of the city that I would never guess is connected to whatever place he has dropped me at. The irritation this causes would be easily assuaged if he kept his mobile phone on, but due to the plague abovementioned, his battery is never charged or the network disappears around him. Which is why after three minutes (which is enough time to search any parking lot in Kampala, as far as I can tell) I called his number, and was pleasantly surprised that he answered the phone. I paused a little. This was due to more than one reason: First, I was dumbfounded because his logic was technically unquestionable. I had asked the type of question that I detest being asked. He had provided a very accurate answer – so accurate that it required no empirical testing. Second, his response confused me because it bore the attitude of reversed paygrades – this was the type of response I could give him, not vice-versa. Third, I was under pressure to find the right words to use to get him to quickly fetch me out of the heavy drizzle. Then I realised that I was the problem here – I didn’t need to know where he was, I needed him to pick me up and drive me to my next meeting. Perhaps that was his passive aggressive message to me? Following his lead, I also used the ‘here’ concept but in the knowledge that mine held clear meaning. I walked back into the building, keeping an eye out for the car. Eight minutes later, I was still glancing up every so often for signs of the car when I noticed a chap in a red shirt trying to catch someone’s attention. MY attention, it turned out. It was the driver, so I walked over to him. “Er…,” I began, seriously worried that the car had been stolen, “…what are you doing here?” I asked, in full control of myself. He gave me a puzzled look that made me think he considered me to be some sort of idiot. I should learn to be specific. But Yes – I ended up getting to my next meeting late. And yes – I did explain to him that as he is the driver and is employed in that capacity, most of the assignments and tasks given to him will involve the vehicle. And, most of all, yes – I resolved to never assume the meaning of anything I tell him henceforth.